Some say less is more, and for some people's skin that works. 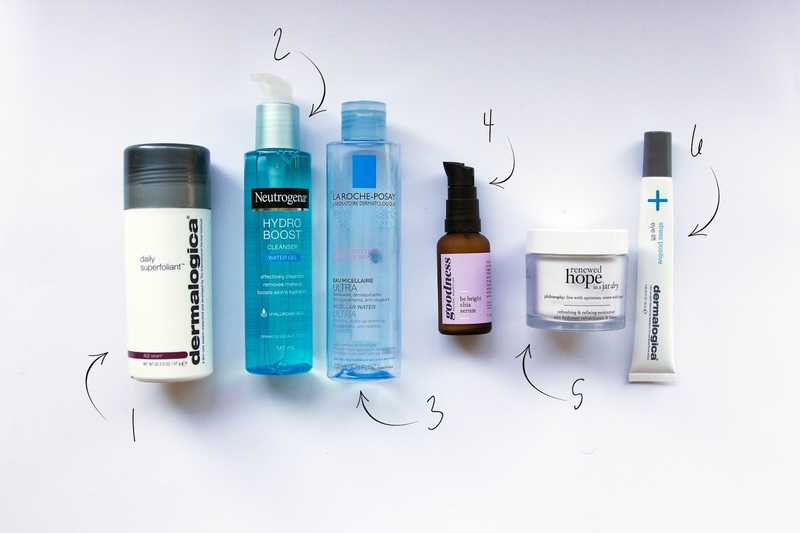 For me however, my temperamental skin needs me to follow a little bit of an extensive skincare regime to help keep breakouts and other less than lovely skin problems at bay. Well except for those hormonal breakouts that always come during that time of the month; no amount of cleanser, toner or moisturiser is going to keep that beast at bay unfortunately. 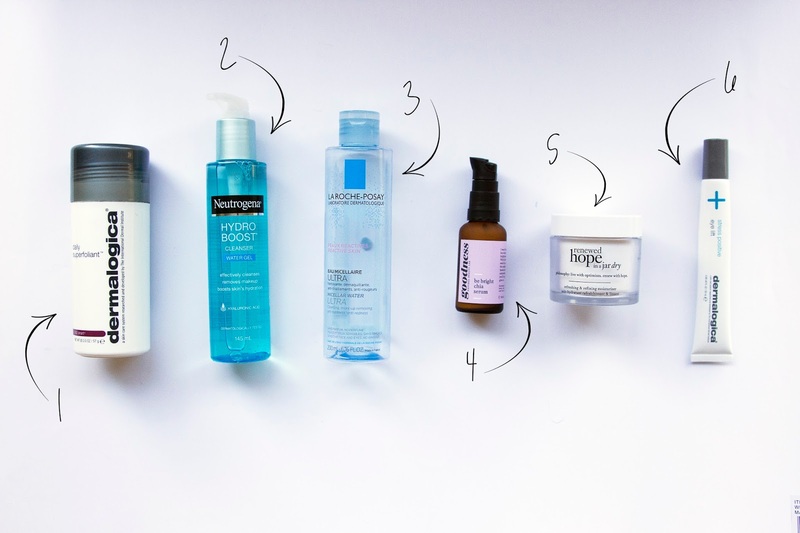 As I've gotten more and more into skincare over the years, my skincare routine has certainly grown, and I think I've finally refined it. While the products I use tend to switch up quite often as I'm constantly trying new things, the actual order and type of products I use always stays the same. As I've become pretty happy with my routine, I thought I'd share the steps I take and some of the products I'm currently using. I always need to start with an exfoliate. As well as acting as the first weapon in my battle to get all the makeup and dirt off my face, it helps to make sure any dead skin that's built up, particularly overnight, is banished and keeps my skin feeling smooth and unclogged. After exfoliating I then do a wash with a proper cleaner, so I almost double cleanse my face each morning and night. 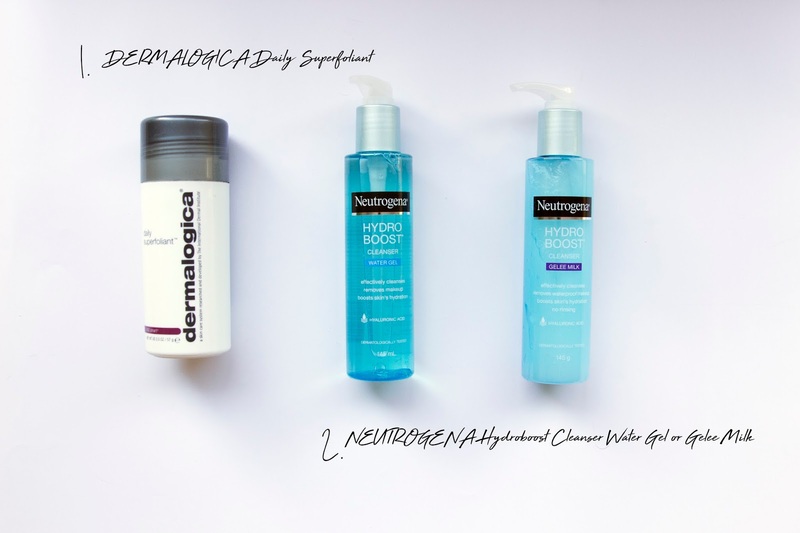 The two cleaners that I switch between currently are the new Hydro Boost Cleansers from Neutrogena, which comes in either Water Gel or Gelee Milk form. These new products add to and compliment the Hydro Boost range you can already find on the shelves. The Gelee Milk acts as multi-purpose product to both effectively clean off your makeup while hydrating your skin. I tend to reach for this one at night so the moisturising effect can sink in overnight. The Water Gel is something I'll tend to grab in the mornings, and this product will also help to remove any dirt from your face while also giving it some much needed hydration so you're looking fresh and ready to tackle the world. This is something I'll pop on after toning at night if I've been wearing makeup during the day. This spray aims to keep your skin free from blemishes that can be caused by wearing makeup for hours on end, and I have to say I've noticed my skin seems to recover and feel a lot better that night and the next morning if I use this after a day of wearing makeup. I find it hard to go wrong when it comes to toner, but the most recent one I've used is this one from La Roche-Posay. As this is a micellar water, I find I can also use this on my eyes to remove any left over mascara and it won't sting my eyes. I like to pop this on during the day because the Gold Dust feature adds a little sparkle to your skin while also helping to maintain an even skin tone. This is the one I'm currently using at night. It's a little thicker than some other serums I've used, but I do prefer having something a little heavier at night when it has time to sink in to my skin. 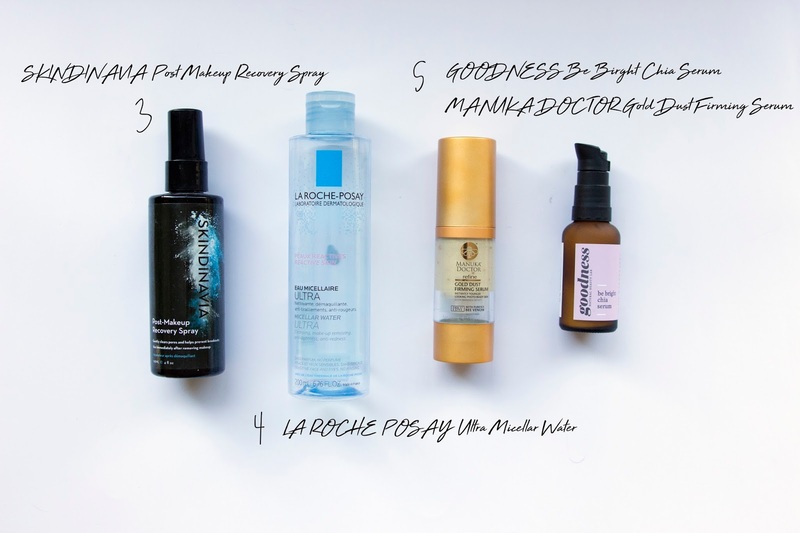 This serum is vegan and fast absorbing, and I honestly have nothing bad to say about it. I love Philosophy products, including this one. There is also a night cream version in this range, but this day cream is nice and hydrating while also being light, so it won't ball up or feel cloggy under any makeup you put on. This moisturiser can be used either day or night, but because I do have a daydream which is a bit lighter, I like to keep this one for night use. I find it fast absorbing and it has a caramel-like smell to it to me which I like. Not much to say other than it does help keep my skin hydrated through the night and when I wake up in the morning I'm not left dry or flaky at all. Adding an eye cream to my skincare routine has made such a difference over the years. Keeping your under eyes hydrated really helps tackle the appearance of any bags or dark circles. You do still need to be drinking enough water and getting enough sleep if you want to say goodbye to them for good, but a good eye cream is also going to do wonders. I love this one from Dermalogica because the applicator helps to keep the product cool while you massage it in into your skin. 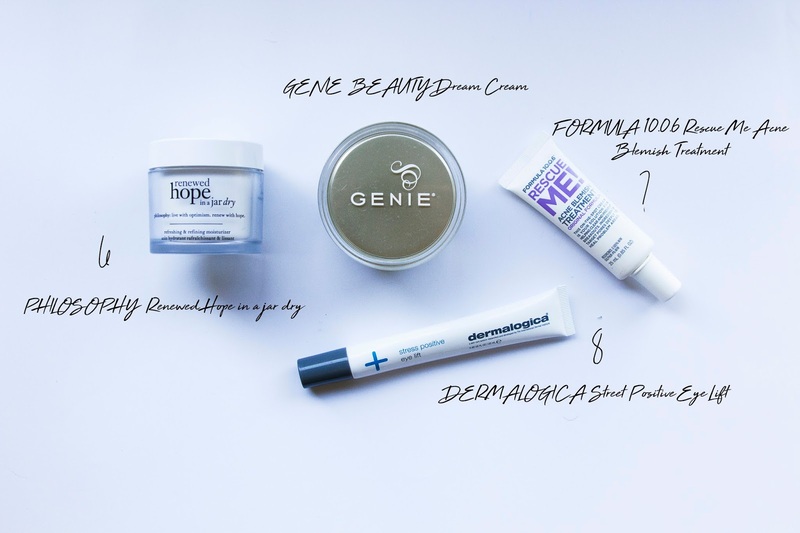 While my battle with blemishes has certainly decreased over the years, I do still get a pesky pimple every now and then (hello that time of the month) and I like to tackle them straight away with this spot cream from Forumla 10.0.6. This does have a bit of a chemical smell to it which can hang around, so I tend to only pop this on at night, but I find it better to apply such treatments then away because they have a better chance of working because they won't get covered in dirt and makeup. This stuff works wonders. Depending on the size and severity of the pimple, if I apply this consistently each night they will usually be diminished and gone within a couple of days, or even over night for quite small whiteheads.